Since East Jerusalem’s unilateral annexation by Israel in 1967, in violation of international law, the Israeli Occupation Forces have relentlessly tried to create a Jewish demographic majority in the city to prevent any future Palestinian sovereignty over it. A variety of measures are used by Israel in doing so, ranging from physically isolating East Jerusalem from the rest of the West Bank through the annexation wall, over revoking residency permits of Palestinians staying abroad and financially disadvantaging the east over the west, to demolishing houses of Palestinian residents. House demolitions in East Jerusalem frequently take place under the pretext of Palestinian residents not having acquired building permits from the Jerusalem Municipality or as a collective punishment of families of Palestinians who are claimed to have carried out attacks against Israeli soldiers or settlers. Mohammed Allain is a 62-year old resident of East Jerusalem and a lawyer who not only deals with cases of house demolitions on a professional level, but who is also personally affected by Israel’s collective punishment policies. “I am now talking as a father and not as a lawyer”, Mohammed emphasizes as he starts to tell his story. On 15 October 2015, Mohammed’s 22-year old son, Bahaa, who was an artist and a popular youth activist in East Jerusalem, went missing. When the Israeli police ordered Mohammed to the station the day after, the father was informed that his son had tried to attack Israeli soldiers, in reaction to which he had been killed. “I did not believe that my son would do that and I wanted to see proof for the attack, but the Israelis did not provide me with any. I also demanded to see my dead son’s body, but the Israeli police refused. They punished us parents in the worst possible way by leaving us in doubt about the whereabouts of our son for 10 months”, Mohammed describes. At the time, 150 bodies of dead Palestinians were kept by the occupying power, largely outside of freezers, which eventually leads to the decay of the bodies. To fight against this inhumane measure and for his own son’s remains, Mohammed found a committee to challenge the Israeli police in front of the courts. When he finally received Bahaa’s mortal remains in September 2016, everything the family wanted was to bury their son and say their good-byes. 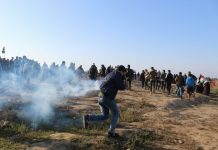 However, the Israeli forces only allowed 10 family members to participate in the funeral, with a large number of Israeli soldiers being present. “As if the major punishment of killing my son, leaving us in doubt about it and disrespecting us by keeping the body was not enough, 10 days after the Israeli police informed us about Bahaa’s death, we received a command under Emergency Law Nr. 17 to destroy our house”, Mohammed explains. The family was given three days to object the command, which would make 8 people homeless, in the Israeli military courts. The objection did not change the decision of the occupying forces and when Mohammed reached out to the Israeli Supreme Court, claiming that the house demolition would be a collective punishment violating international law, the Supreme Court decided in favor of the occupying power in December 2015. Only a few days later, the family’s house was completely destroyed and their residents forced to sleep in a tent in front of their former home, during winter time. “We are not allowed to rebuild and the Israeli police regularly monitors that we don’t do so. I had to rent an apartment for 1,200 USD per month and I don’t feel at home in the new house. The Israelis took my son and they took my home with all the memories I kept in it”, Mohammed reiterates. The Allain family’s house demolition case is one of many, as 25 houses of Palestinians were demolished in 2016 only, 7 of which were in occupied East Jerusalem. In other house demolition cases, the occupying power blames the Palestinian residents for not having acquired a building permit. This is despite the fact that the Israeli authorities impose high restrictions and obstacles on Palestinians regarding building permits, while encouraging settlement expansion in the same areas. In a context of high population growth and no governmental support, many Palestinians are forced to build new houses or attach structures to present buildings to cover the growing family’s basic needs. Nabeeh Basit, a 52-year old father of three children, aged 10 to 22, grew up in Jerusalem’s Old City, where the housing situation is particularly dire. Twenty years ago, he built an additional floor on top of his parent’s house to have more room for his own family. “In 1999, I received an order from the Israeli court to stop building my house, but it was already finished”, Nabeeh explains. Fourteen years later, the Jerusalem Municipality ordered him to destroy his house. “This is my home and I have nowhere else to go, so I tried to fight the decision in front of the court. I paid 35,000 Shekel for a lawyer who did not succeed in the first court and then I paid 20,000 for another lawyer who did not succeed in the second court”, Nabeeh describes. The last court gave the Basit family 1 year time to acquire a building permit, which only served “to delay the destruction and force us to pay even more fines, as the Israelis would never give a Palestinian residence a building permit in retrospective.” After one year of trying to receive a permit, Nabeeh was given the option to either destroy his house on his own, or pay the occupation forces to do so for a price of 80,000 Shekel, in addition to jail time and a fine of 40,000 Shekel. “Four months ago, I started to destroy the home I have built with my own hands. It was very difficult for my family and me, as a lot of memories are attached to it, and particularly my 10-year old son suffered. He did not understand why we had to destroy his home”, Nabeeh describes. After having torn down the walls and interior of the formerly three-room apartment, the Jerusalem Municipality demanded pictures of the house being destroyed in its entirety. Since four months, the family of 5 has been forced to live in one bed-room and share the kitchen and only bathroom with the extended family. “Even though we cannot live in our own house anymore, the authorities still demand me to pay Arnona, the property tax, which is 8,000 Shekel per year. This is no life, but we don’t have any other choice”, the father reiterates. House demolitions following a missing building permit are related to racial discrimination inherent to the Israeli Occupation Forces when dealing with non-licensed buildings of Palestinian residents. Applying house demolitions as collective punishment against innocent Palestinians violates Article 33 of the Fourth Geneva Convention, prohibiting collective penalties against protected persons and their properties. With house demolitions and collective punishment policies, the occupying power is not only violating international humanitarian law, but lastly creating a Jewish demographic majority in Jerusalem by expelling its original Palestinian inhabitants.